What Comes Before Black Friday? – White Sunday! Before the Black Friday Sales – Come in for our White Sunday Sale! Later this month, get a head start before all the craziness of shopping for the perfect gifts for your family this holiday season. Take advantage of our White Sunday Sale and book a Mini Portrait Session (30 minutes) with us and get some great photos that are perfect for holiday cards and gift giving. 30 minutes, One outfit, White background and you’ll be all set for the holiday season. We have a large selection of options and samples for holiday cards this year, so come on in and take a look all our great card samples. We have something for everyone and we can customize your cards to say whatever you wish. Best of all, we will have your cards ready fast, so you can send them out early (envelopes included with most of our card selections). that you can keep and also share with your loved ones this holiday. Our White Sunday Mini Portrait Session is only $50. Our White Sunday Sale is One Day Only, so call today to reserve your appointment time! Sunday, November 24th with appointment times between 10AM and 7PM. These won’t last long, so call today or contact us by e-mail to setup your appointment or for more info. Looking forward to seeing you at our studio! There’s something very special about gathering your family together during the upcoming holidays. Celebrate that magic with our Home for the Holidays portrait sessions. Whether you have a gorgeous fireplace, staircase or backyard setting in mind, we will create the family memories of your dreams, right in your own home. Get your family together and let us create your Heirloom Holiday Family Portrait, or plan a portrait session that includes your kids, that will be home from college soon. This is the perfect time. 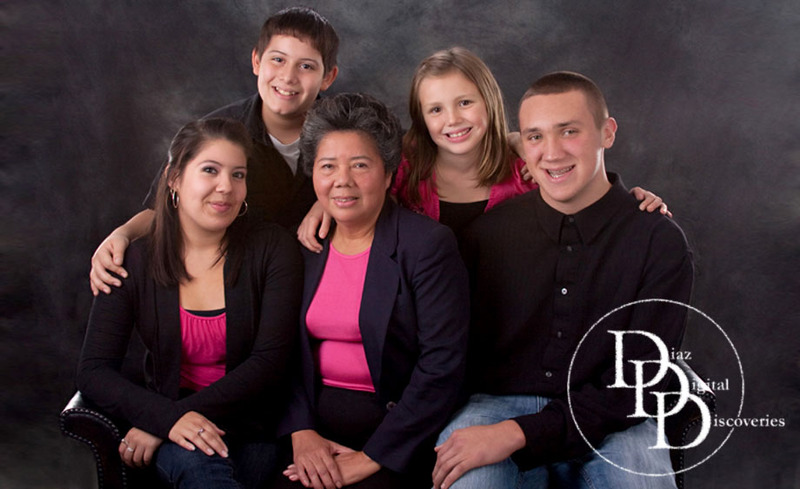 If you prefer a more formal traditional studio portrait session, we create priceless images that will capture your heart, such as this Generations Portrait above with Grandma Tiba and all her grandchildren. What a great and beautiful moment this was! Thank you very much for choosing us Tiba! Our Home for the Holidays sessions are available now through the end of November, but spots will be booking up quickly! Book your session now, for the best flexibility on our calendar and get your portraits in time for holiday gift giving and wonderful Holiday Cards. 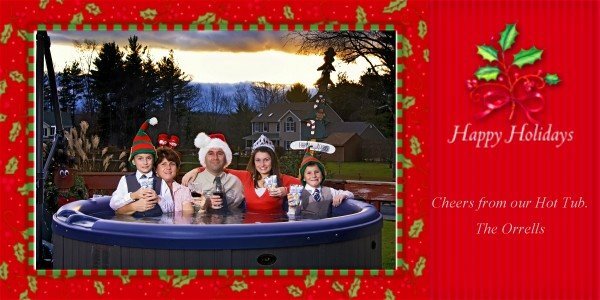 BONUS: Book your Home for the Holidays portrait session before November 1, 2012 and get 50 Custom Photo Holiday Greeting Cards FREE with any portrait package order. 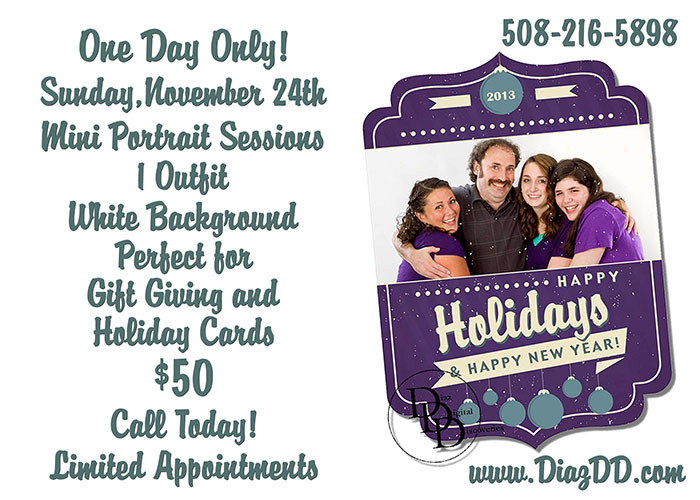 Call us at 508-216-5898 to find out more and reserve your Home for the Holidays portrait session today! 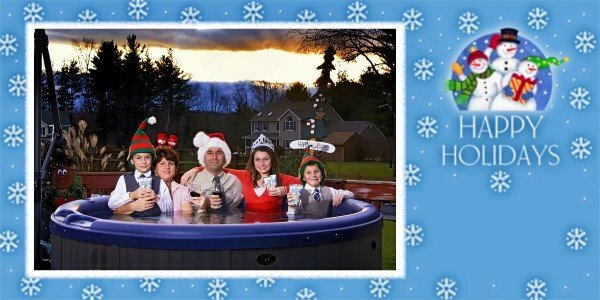 SEND CHEERS FROM YOUR HOT TUB THIS YEAR!!! This year why not send FUN holiday cards to your friends and relatives. We could all use a good laugh during these trying times. Call us today to book your holiday family portraits and get the family together for some fun images that you can share with your friends. I always enjoy getting holiday cards from my friends and family, but most of them are always that standard (formal) photograph. This year, lighten-up a bit and send out some fun photographs your friends and family will be talking about all year long. We can help you think of ideas and images that will be fun, funny and creative. Like the Orrell family, pictured here…Now they know how to have FUN! Incase any of you are wondering…YES, they did actually get into the Hot Tub! This is not photography magic. It’s all part of the fun and the memories that make these images so great. There are only a few more appointment slots left for holiday portraits, in time to get out those holiday cards, so call now and book your session with us. 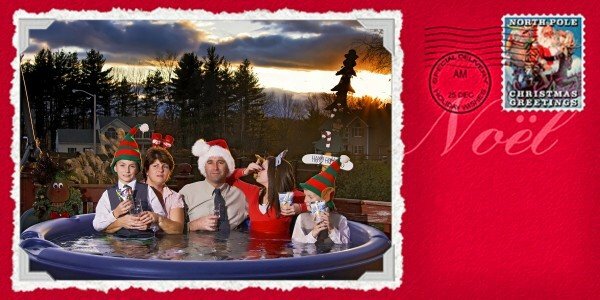 We can usually have your holiday cards ready within 7 days. Enjoy your Holidays and don’t forget to have FUN!!! Diaz Digital Discoveries is a professional photographer and video services studio located in Oxford, Massachusetts. We specialize in wedding, engagement, portrait and event photography and videography. We serve all New England states.